This entry was tagged Buildings, Finnmark, Norway, Photography, Vardø. Bookmark the permalink. The light and charm of this vision is so beautiful! The colours are outstanding. 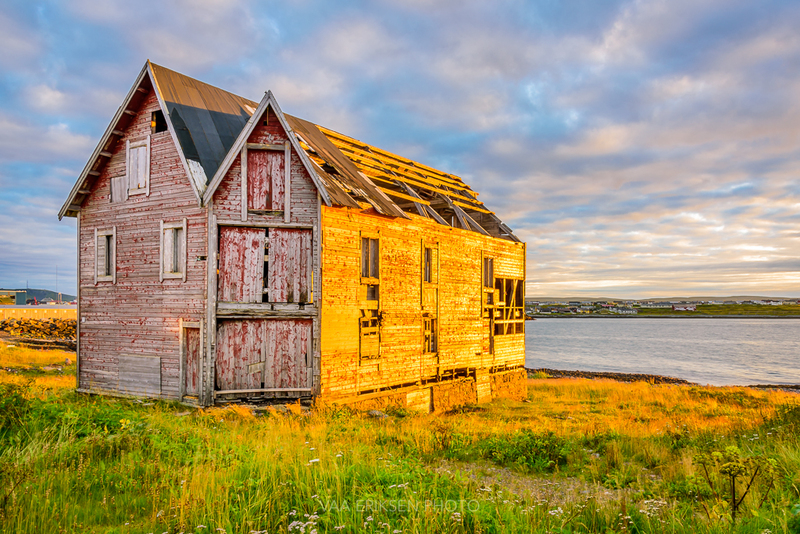 Another wonderful photograph, and the building is beautiful – ramshackle adds to the charm! Beautiful image, amazing depth of field! Was it a family house? Thank you Inese! I have no idea what this house was originally used for as it was only one of many older ones just left to degrade. No information on what these houses were once used for. I can only guess, but the size of the house and the location makes me think it was probably used for some sort of industry or fishing. People along the coast at that time were generally poor and would have smaller houses, but I could be wrong. You are probably right about the size of the house. I too though it could be something related to the fishing business, may be an office and guest rooms for fishermen from the distant villages, and a storage. Anyway, everything changes, but these beautiful sun-lit shores stay the same. Absolutely, the shore is the same but everything around it changes. Makes you think back at how life must have been here once. Fishing was definitely a big part of it. Pomor trade was also a big thing in Vardø, trading with the Russians. Vilket ljus! Gammalt men så vackert! Gorgeous lighting Inger! Such a spectacular image. I love the warm yellowish colours that contrast with the grey-red of the front. When I think of ramshackle buildings, I always see them black/white but these colours are just amazing. Beautiful capture! The light is gorgeous! Beautiful light and abandoned buildings always seem to go together and you did that so nicely here. Much appreciated Randall! Vardø was an exciting city to visit. I was amazed that people would settle down in this harsh environment. I guess it doesn’t look to harsh int he photo, but it must be during winter as it is very exposed to the Barents Sea. Another pretty good image. Light is amazing! Thanks again, really appreciate your lovely feedback. We found this house earlier in the day but the light was not good so I really wanted to return for the golden hour:) And I didn’t regret! Ramshackle buildings are so atmospheric and are great to photograph – this one though is outstanding, the colours surreal, perfect angle. Wonderful. I think it is absolutely beautiful. What a wonderful photo! Outstanding and breathtaking!